In the past two weeks I’ve had two customer environments come to me with the same issue. Random Outlook 2013 clients are unable to configure their Out Of Office settings. Specifically, they would get an error message when trying to open their OOF settings to set them. Some users had no issue while others got the error. Both environments were Exchange 2007 on latest Service Pack/Update Rollup & had a few users running Outlook 2013; only a few of which were having this issue. After some searching online I found this thread pointing to a recent (November 12th 2013) Outlook Security Update as the culprit. In my case, after uninstalling KB2837618, rebooting the client, & re-creating the Outlook Profile (a profile repair did not work) then Out Of Office started working again. Your automatic reply settings cannot be displayed because the server is currently unavailable. Try again later. 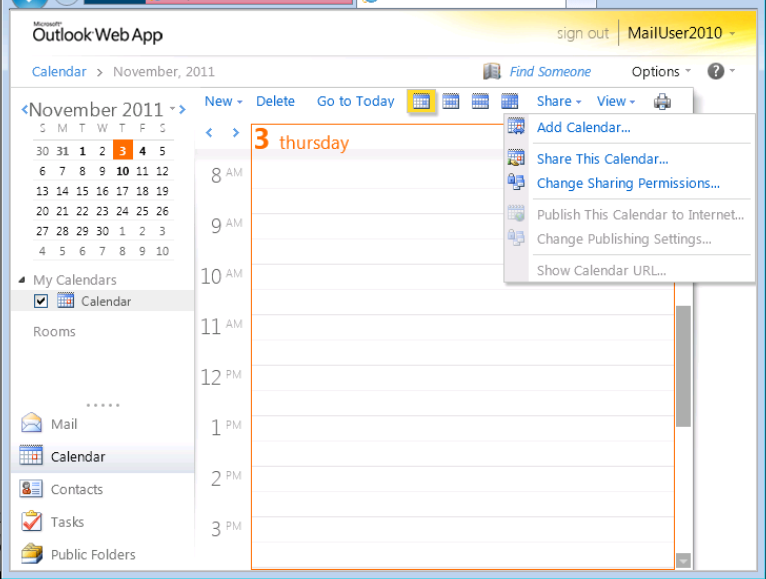 You cannot retrieve Free/Busy data for calendar scheduling. Add-ins that use the Account.SmtpAddress property no longer work. These features rely on an underlying Autodiscover technology. After you install this security update, Autodiscover may fail for Exchange 2007 configurations. Therefore, Outlook features that rely on Autodiscover will also stop working. Microsoft is researching this problem and will post more information in this article when it becomes available. Members of the Exchange 2013 Technology Adoption Program (TAP) have known about this issue for a while & the general public had the potential to figure it out once Exchange 2010 SP3 came out last month which allowed co-existence with 2013 in a lab environment; now the Exchange Team has been very clear about it with this recent blog post today. Actually, a Microsoft Support-led session at MEC was when I first heard about it in detail. So what’s the issue? Basically, you have the potential to experience an organization-wide full Offline Address Book download just as a result of installing the first Exchange 2013 server into your existing Exchange environment. 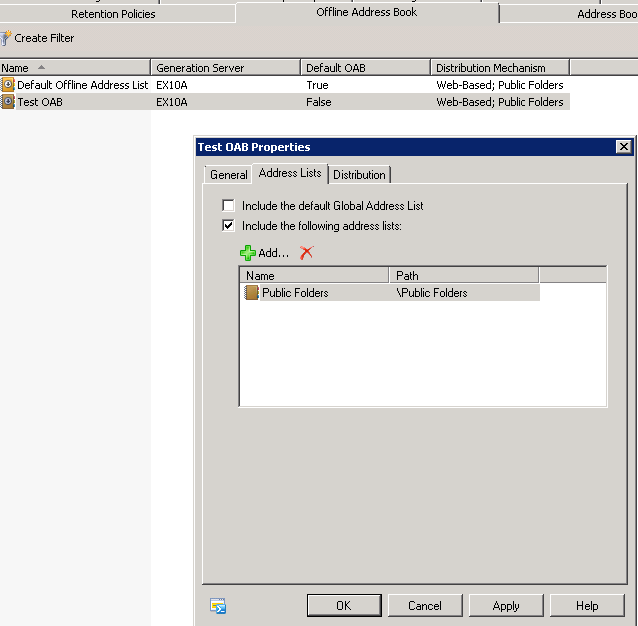 The Offline Address Book is used by Outlook Cached mode clients to be able to have offline access to Address Lists as well as some Group Metric data when they aren’t connected to the Exchange Server. For a very detailed explanation from Neil Hobson see the following article from him. Issues can occur when the OAB for an organization grows to a large size, sometimes in the hundreds of MB. Things that contribute to this size are things like number of recipients in AD, number of distribution groups, populated user attributes, & certificate usage (reference ). It’s important to note that GAL Photos are NOT stored in the OAB. The OAB just includes a pointer to AD where the photo is actually stored (reference ). Fortunately, Exchange/Outlook is smart enough to only download the changes to the OAB instead of the entire thing every day. There are still some circumstances where the entire OAB will be downloaded again, which makes it very important to understand the size of your OAB so you know just how much of your networks bandwidth will be used when all Outlook Cached Mode clients perform a full download (reference ). So as you might imagine, whether or not clients will perform a full OAB download becomes a topic of concern during an Exchange migration. Many organizations just have 1 OAB & as a result have never populated the Properties>Client Settings>Offline Address Book value of their Mailbox Databases. This is where a big issue can come into play during an Exchange 2013 migration, or even if you just want a single Exchange 2013 server in your environment for a test group of users. As the recent Exchange Team Blog post announcing 2013 CU1 states, you need to make sure all of your Exchange 2007/2010 Mailbox Databases have an actual value populated for their Offline Address Book. If they are currently blank, then populate them with your current Default OAB. Nothing will change in the environment as a result of this because they will continue to use their current OAB & continue to only download the OAB changes. 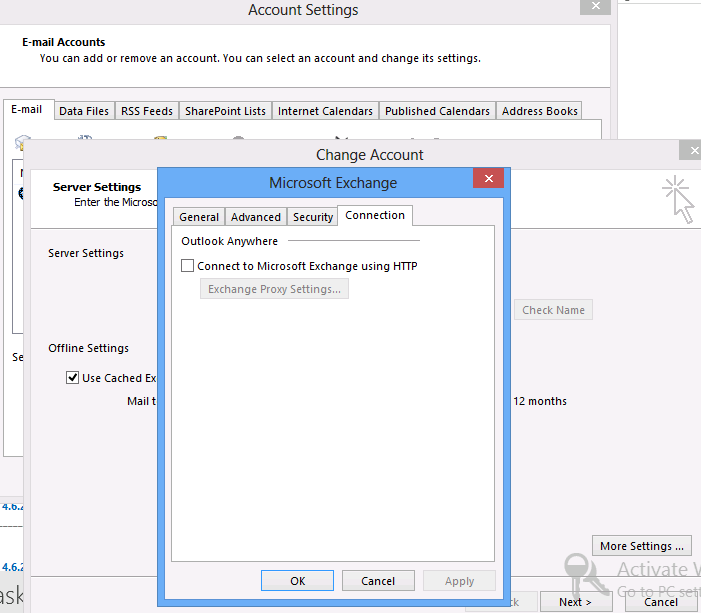 Failure to do this will result in each of these Mailbox Databases switching to use the Exchange 2013 Offline Address Book that gets created during installation of your first Exchange 2013 Mailbox Server. This will result in a Full OAB Download for all of your Outlook Cached Mode clients on these Mailbox Databases; a potentially nasty situation which could bring your network to its knees. This lists all Mailbox Databases in your environment with their OfflineAddressBook attribute set to $null. This command will grab each of these Mailbox Databases & populate the OfflineAddressBook attribute with the value of your Organizations current Default OAB. 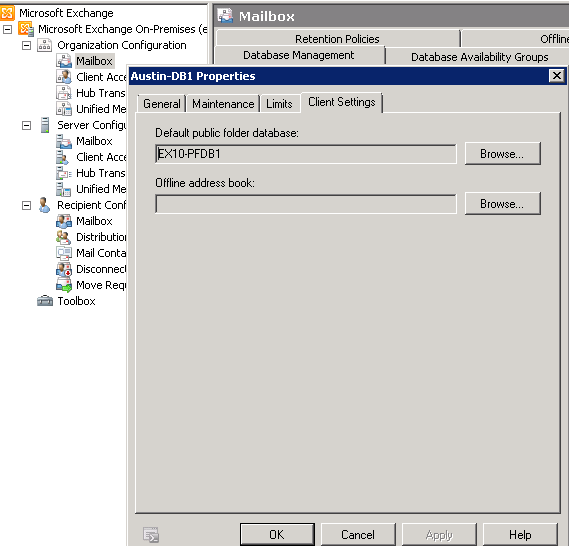 Effectively changing nothing in terms of client behavior but ensuring that when you install Exchange 2013, each of these Mailbox Databases do not switch over to using the 2013 OAB; at least not until you are ready & can stage this process, maybe one MDB at a time. These steps should be mandatory for any organization considering implementing an Exchange 2013 Server into their existing Exchange 2007/2010 environment. So this is a complicated scenario but only because this particular customer made it that way; in fact the solution ended up being very simple. One of my Consultant co-workers pinged me on an issue he was sorting through at a customer site. They were using UAG for their Outlook Anywhere endpoint, both internally & externally. They had a policy to only allow Outlook Anywhere for roughly 30% of their user base. They were enforcing this using AD group membership in UAG to block access to the Outlook Anywhere rule for all users except for those on the allowed list. When internal Outlook users moved between wired & wireless networks (or vice versa), Outlook would be disconnected just long enough for it to attempt an Outlook Anywhere connection over HTTPS (since the RPC/MAPI connection didn’t reconnect quite fast enough for Outlook’s liking). Well since they were using NTLM for Outlook Anywhere this didn’t really pose a problem for the users who had been allowed to use the OA rule in UAG. However, the users who had been blocked (the majority of their users) would get Outlook auth prompts. This raised another question from the Consultant & the client; why does enabling Outlook Anywhere on your Client Access Server result in all Outlook clients being enabled for Outlook Anywhere? Shouldn’t there be a method to disable it by default & only enable it via AutoDiscover in Outlook on the mailboxes we choose? Well I’m not Microsoft so I couldn’t answer that but what I was able to do was give them a much better solution going forward which wouldn’t require the hassle of managing group membership for the UAG rule. When you enable Outlook Anywhere on your Client Access Server (Exchange 2007/2010), AutoDiscover will then start handing out information to all Outlook Clients on how to connect via OA if a direct RPC/MAPI/TCPIP isn’t available. This allows external Outlook clients to connect to their Mailbox without the use of a VPN. Exchange AutoDiscover hands these out using what’s called Outlook Providers. 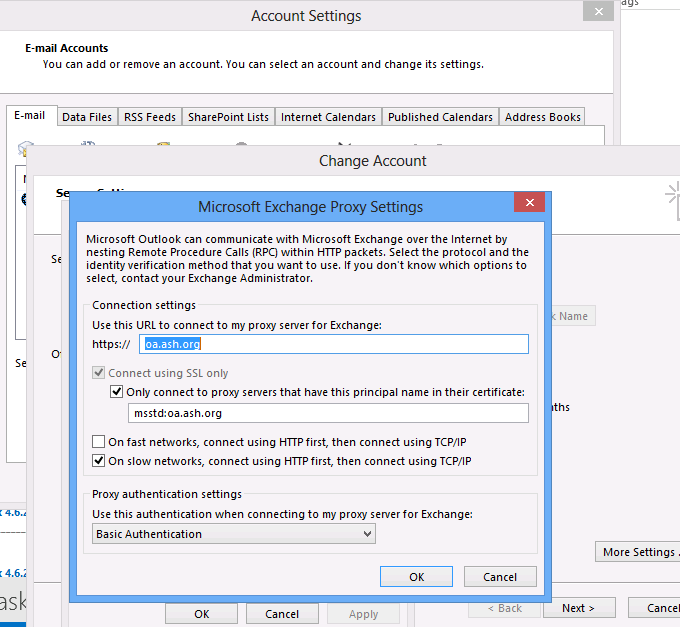 These allow Administrators & Exchange itself to differentiate between the various settings used with Outlook Anywhere VS direct RPC/MAPI/TCPIP connections. The EXCH Outlook Provider is used to hand out settings used when connecting via RPC/MAPI/TCPIP while the EXPR Outlook Provider is used to hand out settings when connecting via Outlook anywhere (RPC over HTTPS). You can view the settings of each by running Get-OutlookProvider | Format-List. 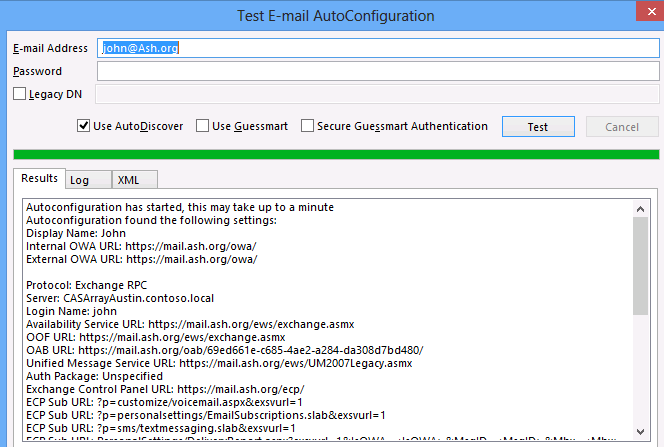 This is the response received using the Test E-mail AutoConfiguration utility in Outlook for a mailbox after Outlook Anywhere has been enabled in the environment. This image shows the EXCH settings. This image shows the EXPR settings received in the same AutoDiscover response. These are the settings Outlook will use to connect to Outlook Anywhere if it needs to. Notice here it says “Exchange HTTP” for the Protocol opposed to “Exchange RPC” in the previous image. 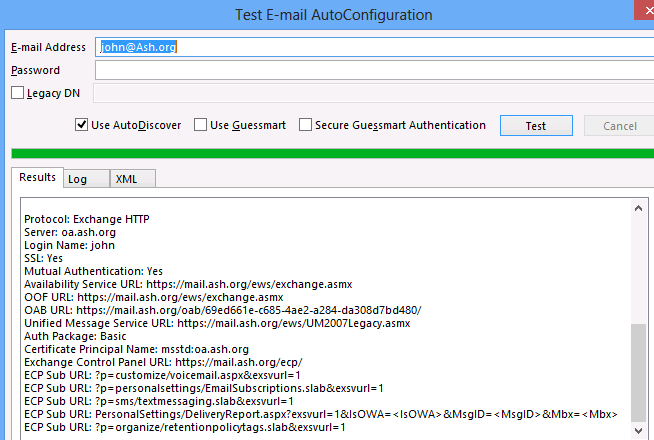 Below you’ll find the XML response from the “XML” tab of the Test E-mail AutoConfiguration utility. 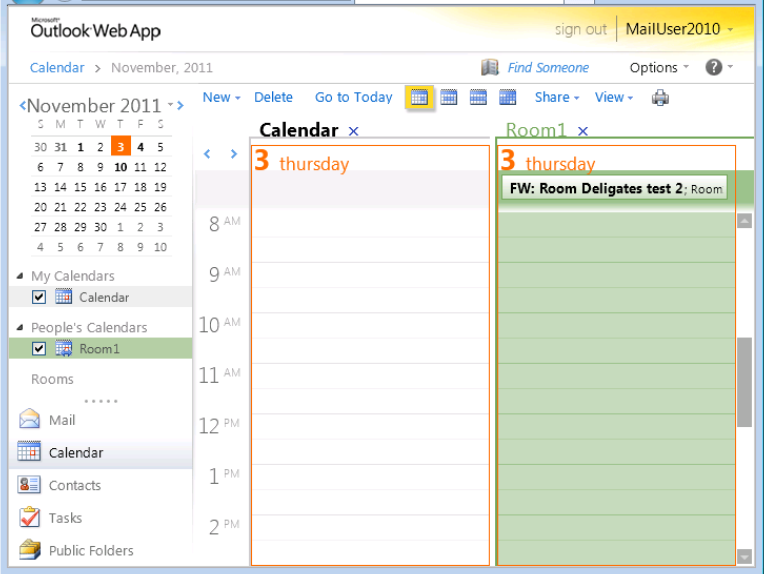 You can see the settings for both the EXCH & EXPR Outlook Providers. So the solutions here is actually fairly easy & oddly enough, not well known. The Set-CASMailbox command can be used to block a particular mailbox from accessing various Client Access features. In this case we can use it to block Outlook Anywhere for John’s Mailbox. (Note: This command can also be scripted or piped to take effect on any number of mailboxes in the environment). After running this command you may need to wait about 15min for AD replication to take effect as well as 15min for AutoDiscover, Outlook Anywhere, & ultimately Outlook to take the change. To speed this process up you can recycle the MSExchangeAutodiscoverAppPool in IIS as well as restart the Microsoft Exchange Service Host service on each CAS. 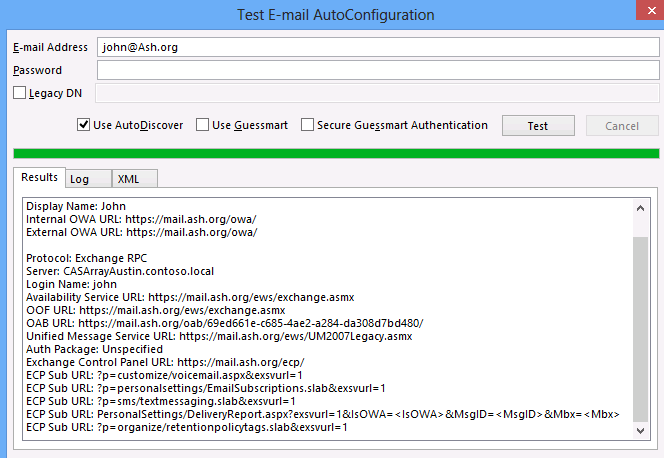 Now, if you run Test E-mail AutoConfiguraton you’ll see that the Outlook client doesn’t even get the EXPR response because they’ve had that feature blocked. Now if you look at the Outlook Anywhere settings (below) in Outlook, they are no longer even configured/enabled. Now in my lab using Outlook 2013 I had to actually perform a profile repair to get this change to take effect immediately. You will likely either have to wait longer for it to take effect or manually repair the profile. So in this customer’s case, users who were not allowed to use Outlook Anywhere would not get the Outlook Authentication prompt when moving from internal wired to wireless or vice versa because their Outlook client never attempted the Outlook Anywhere connection; they just remained in a disconnected state until the new connection came fully online. Also, after showing the customer this command they no longer had to rely on UAG to control who could or couldn’t access Outlook Anywhere; they could now just script the Set-CASMailbox command. 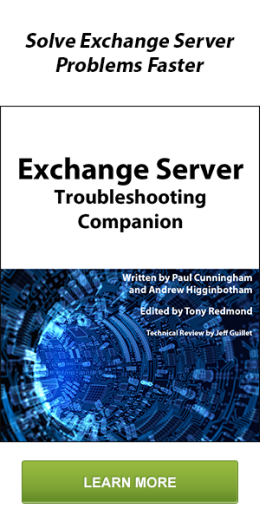 My colleague Jedidiah Hammond wrote a great post awhile back on troubleshooting Exchange Service start-up issues. 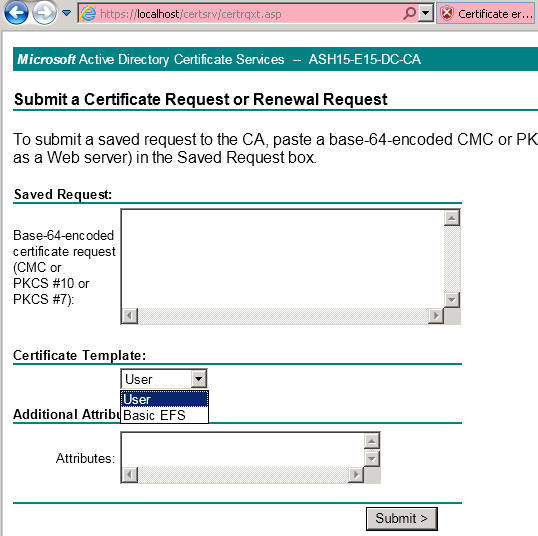 One of the main areas of focus of the post were issues with Active Directory Global Catalog servers. This can be considered an ad-on to that post as I’ll describe a useful method to troubleshoot Exchange permissions in Active Directory; more specifically, verifying Exchange has the proper access to the Global Catalog servers in and out of it’s respective Active Directory site. Suppose you find that the Microsoft Exchange Active Directory Topology Service isn’t starting; or the System Attendant, or the Information Store service. Or perhaps the Exchange Management Console or Exchange Management Shell will not connect and is complaining of Active Directory/Global Catalog issues. Often times this is a result of a port being blocked by Anti-V/Firewall between the Exchange Server and your Global Catalog. Or possibly a configuration issue on the network stack (IP/DNS/etc); maybe someone even powered your GC off much to your dismay. Assuming you have already worked through the above scenarios, one useful tool to verify Exchange/AD functionality is actually a very commonly used one; Event Viewer. When you first deploy Exchange and run “setup /PrepareAD” (or you let the GUI setup do it for you) it is actually setting many of these permissions in AD. 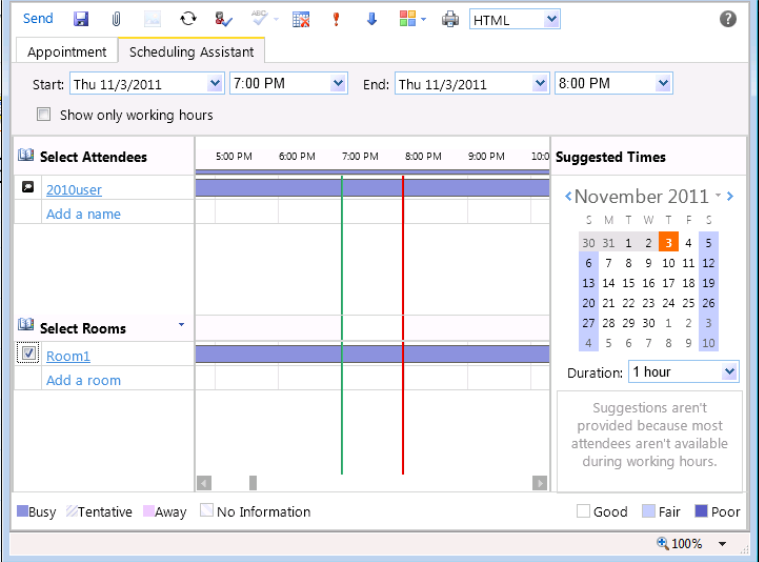 (For a list of all of these changes see this Technet article). 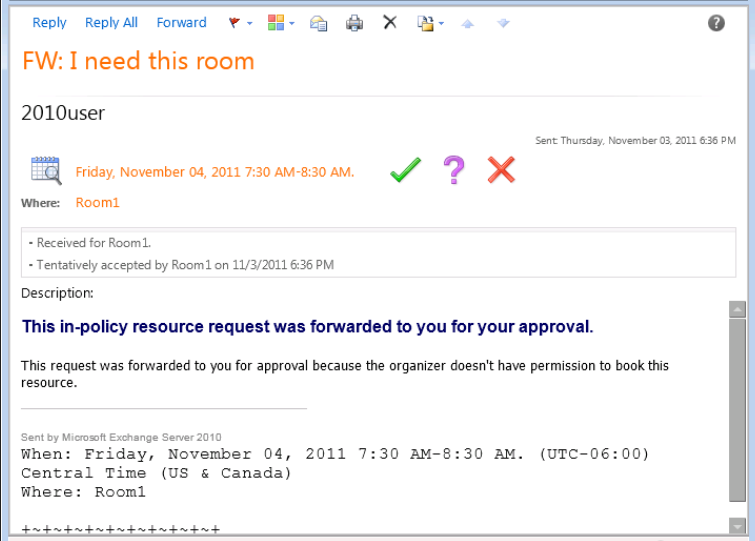 Below is an excerpt from MSExchange ADAccess Informational Event ID 2080. You’ll find it occurring roughly every 15min on your Exchange Servers. This is an example of what the output should look like. You might be asking what those series of numbers represent. Well buried deep within the land of Exchange 2000 there lies a KB article explaining just that. Notice it ends with “0171” instead of “1171”. If we reference the above KB article then this tells us Exchange lacks the proper ACL’s in AD. I’ve seen this many times with customers who have modified the Default Domain Controllers Group Policy or somehow blocked it’s use. I’ve also seen similar issues arise from unchecking “Include Inheritable Permissions from this Object’s Parent” in AD for various objects. If this is the case then please see the post I referenced earlier on how to resolve that. In addition, I’ve found re-running “setup.com /PrepareAD” to be a very useful troubleshooting step in situations such as these where you feel AD permissions may be at fault. Some customers have been weary of running this but honestly their fears stem from ignorance because “it just sounds scary” ; a quick read over the article I referenced earlier will tell you that running it again will only re-add the permissions Exchange has needed all along. However, be aware that re-running PrepareAD may only resolve the issue temporarily as any bad Group Policies may find themselves being re-applied in about 15min so fixing the actual source of the issue should be the ultimate goal. An additional note here is if you’re utilizing AD Split permissions with Exchange, there may be additional precautions to be taken before running PrepareAD again. Customer had hired a Consultant to originally setup their Exchange 2007 environment and now their Certificate had expired. Was originally setup to use their 2008 Enterprise CA so customer not only did not know how to generate the request from within Exchange but also did not know how to submit it to their own CA (I know). 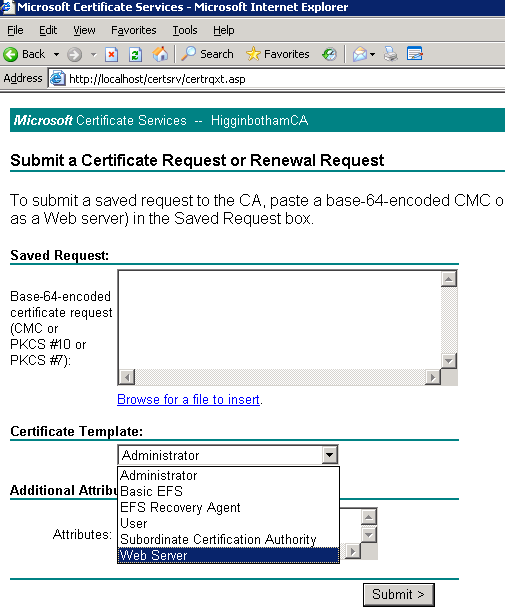 Now with a 2003 CA I would just generate the certificate request from within Exchange Management Shell then Browse to http://CA-Name/CertSRV> Click Request a Certificate>Advanced Certificate Request>Submit a Certificate Request by Using a Base-64…..>Then select “Web Server” from the Certificate Template drop-down (Figure 1). This obviously makes it difficult to use the old familiar web-based interface to request your certificate. I believe these additional templates were removed from /CertSRV by default due to security reasons but I have yet to confirm. Once you get the cert file just import it using Exchange Management Shell (if 2007; I usually recommend the GUI Wizard in 2010). In searching to see if anyone else had published these steps I ran across the blog of Jeff Schertz. I’ve been to his blog before and always find great content. Here’s the referenced post but check out some of his other great articles; specifically for Lync. Edit: Check this post if you receive a “Certificate Not Issued (Incomplete)” message via command prompt. 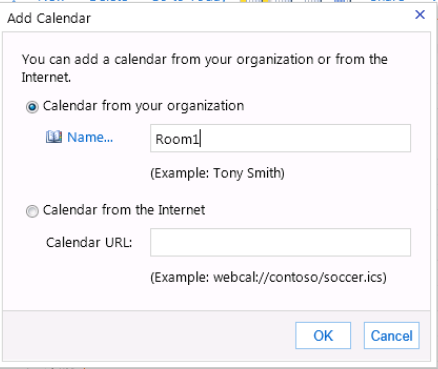 You can now add the calendar to view and approve in OWA and two users are now able to authorize room access.